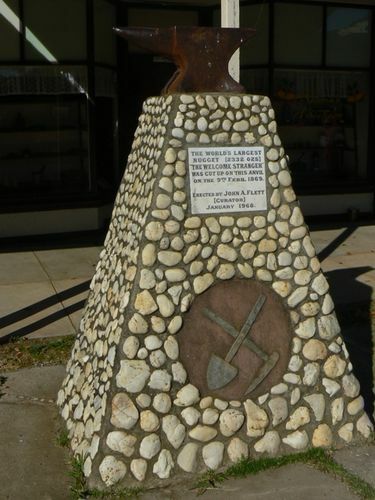 The Welcome Stranger monument was erected by John A. Flett and consists of a miners` pick and shovel commemorating the anvil on which the gold nugget was cut on 9 April 1869. The 66kg 'Welcome Stranger', then the world's largest-known gold nugget, was taken to Dunolly where it had to be broken on an anvil before it could fit on the bank's scales. It was worth 10,000 pounds - around $3-4 million in today's money. Deason returned to Moliagul and his descendants are still in the area. Oates returned to Cornwall.